It seems that sometimes the best toys aren’t really toys at all. We’ve all seen the little kid that loves the box better than it’s contents, right? Or how a laundry basket could be a sled, a space ship, or when combined with a blanket it becomes a fort. 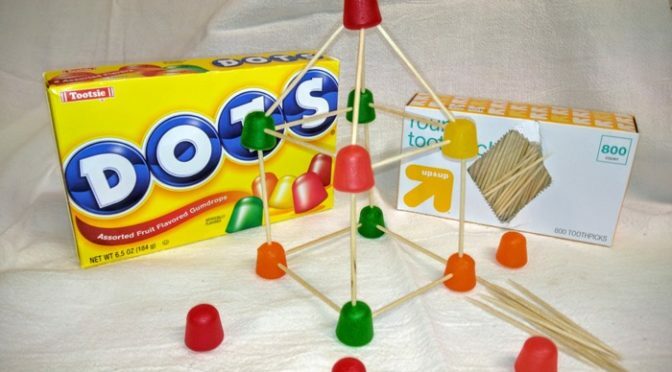 One of my favorite “non-toy” toys is using toothpicks and candy as a building set. Dots or gumdrops work best. 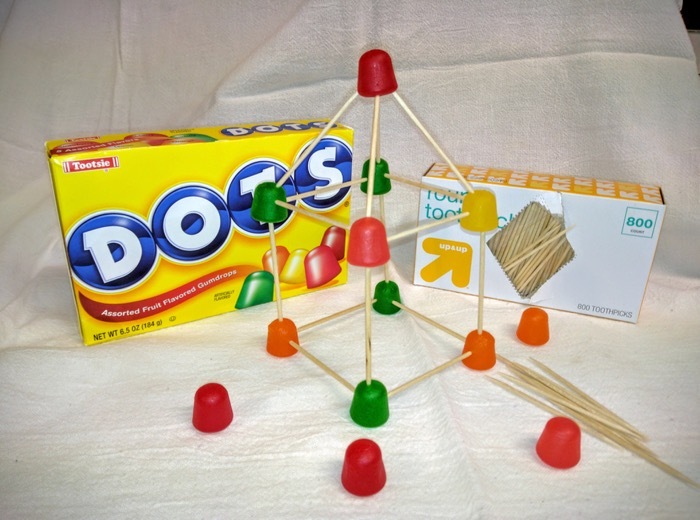 The cool part about this low-tech candy erector set is that you can build whatever you want. Then take it apart and build something else. When you’re done you get to eat the candy! With a little supervision even little kids will enjoy playing with candy. If you don’t want them using toothpicks you can substitute uncooked spaghetti noodles. The benefit to using spaghetti is you can break them into whatever sizes you want. Give this a try! It’s creative, fun, and tastes great! What’s your favorite “non-toy” toy? 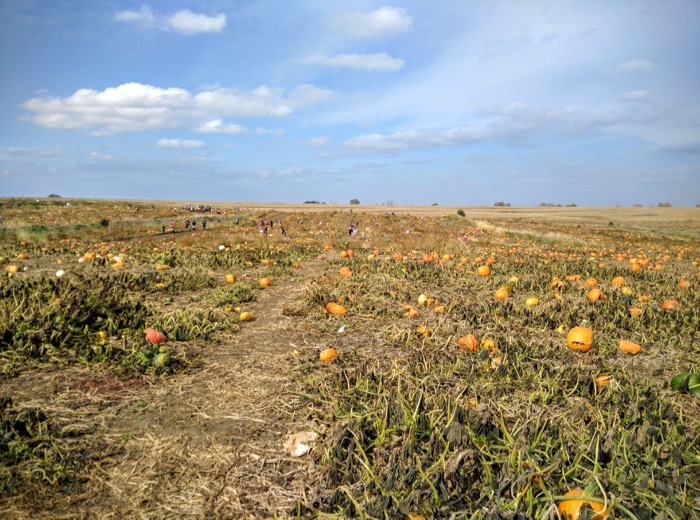 One fun thing my family loves to do every Fall is to go to a pumpkin patch. My oldest daughter even added it to her guest post she wrote here a few years ago. 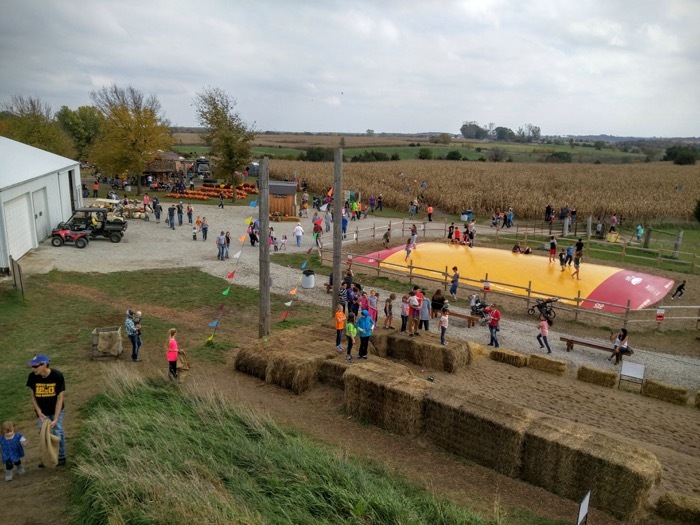 Our family has been to several around Central Iowa… but our favorite is The Pumpkin Ranch in Winterset. It’s been our “go to” spot two years running. We visited on a recent Sunday afternoon and had a blast. We arrived around 1pm and the place was a flurry of activity. 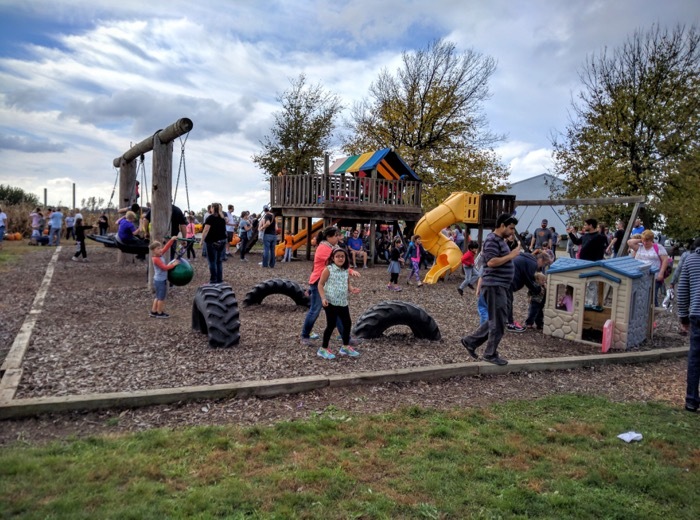 There were kids running around from activity to activity, tractors hauling folks to pick out their pumpkins, and a crowd around a magic show. My youngest wasted no time running towards the slide hill. She got halfway up before realizing she forgot to grab a burlap sack to slide down on. Sack in hand, she was at the top sliding down in no time. A few more times down the slide and it was off to the jump pillow. 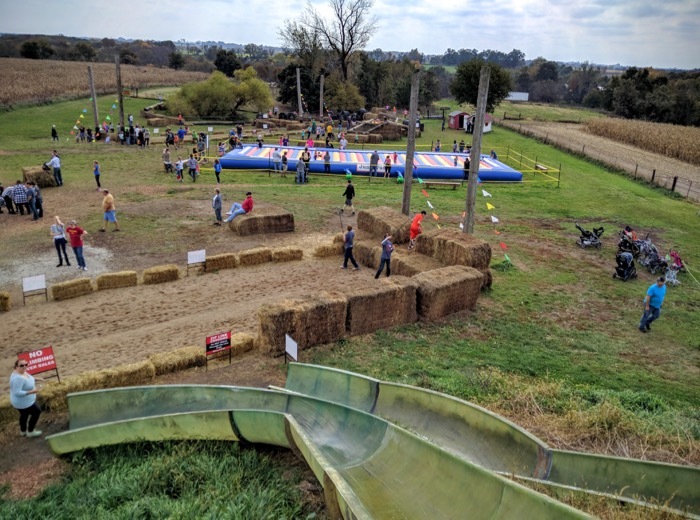 The Pumpkin Ranch has two different ones. One for those under 42″ tall and one for those over 42″. My girls tossed their shoes by the fence and had a blast jumping. I was surprised by how much air they could get. The zipline was next. Again, there were 2 different sets depending on your age and size. My youngest is a zipline fan and enjoyed it… but she did say it made her want to go back to the Wisconsin Dells to do the Bigfoot Zipline Tour again. You can see a video of her and I ziplining in this post. We ran into some friends from Church by the obstacle course. 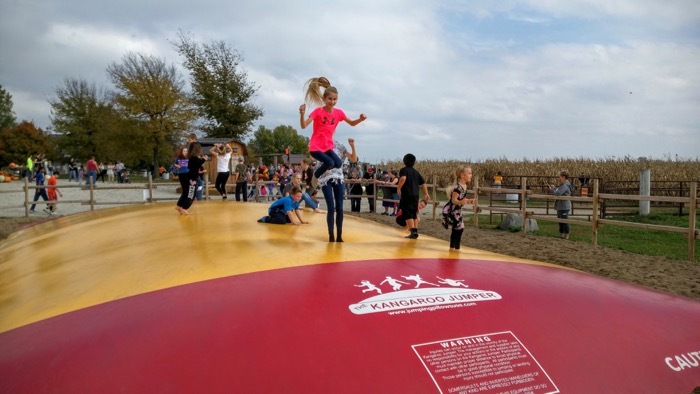 This was the 2nd year for their family to come to The Pumpkin Ranch. Like our family, they thought the fun and value was worth the hour drive. Before tackling the 10 acre mega corn maze we grabbed some snacks at the concession stands. 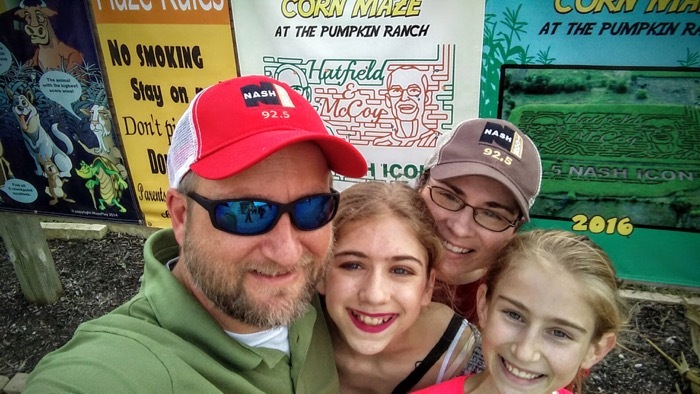 I was excited to check out the corn maze because two friends (and co-workers) faces are carved into and make up part of the maze. It’s amazing how accurate their likenesses are. I will say that it made me chuckle saying, “The next checkpoint is on Eddie’s chin. We need to go straight and a little to the left”. 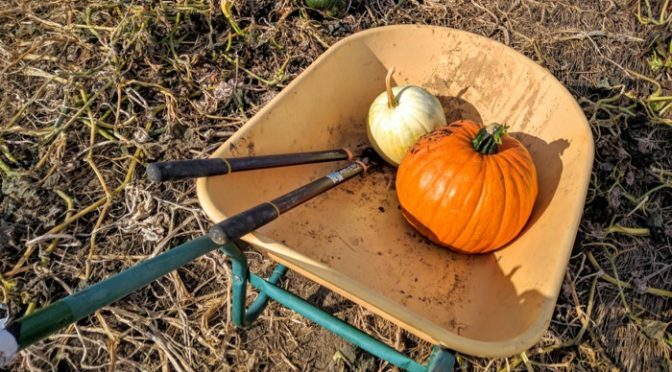 After successfully making it through the maze it was time for my daughters to pick out their pumpkins. To do that we caught one of the tractor and wagon rides out to the patch. 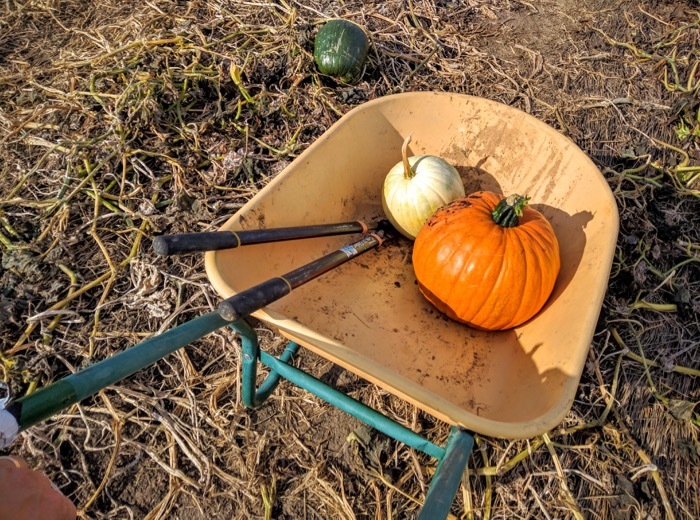 There were pumpkins of all shapes, sizes, and colors. My oldest wanted a white pumpkin to paint a face on and my youngest was looking for the perfect one to carve. I really didn’t care what they got as long as I could roast the seeds. Pumpkins are 49 cents a pound which frustrated the control freak in me… but that frustration was eased by our guide who said a basketball sized pumpkin averages around $5. He was pretty accurate too. The pumpkins my daughters picked out totaled just under 12 dollars. We picked up a few other little pumpkins and gourds in the gift shop area and then headed home. The drive to and from The Pumpkin Ranch is a favorite of mine. 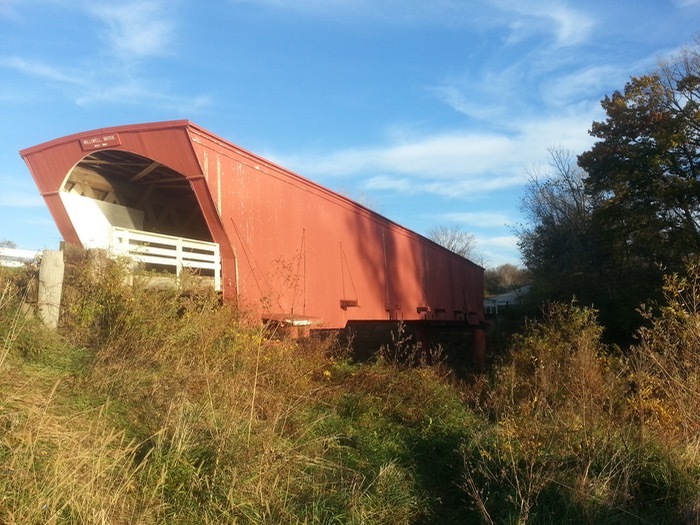 It’s in Madison County which has a beautiful countryside made even more awesome by the colors of Autumn. One thing I would recommend when you visit The Pumpkin Ranch is to factor in a little time to visit some of the Bridges of Madison County. There are a few that are fairly close. We didn’t make it to any of the bridges this year but did last year. Based on our two trips to The Pumpkin Ranch I’d say to plan on spending 3-4 hours for your visit. Admission is $9 per person on the weekend and $7 per person on Fridays. That price includes all the activities for the day of your visit. Kids two and under are free. 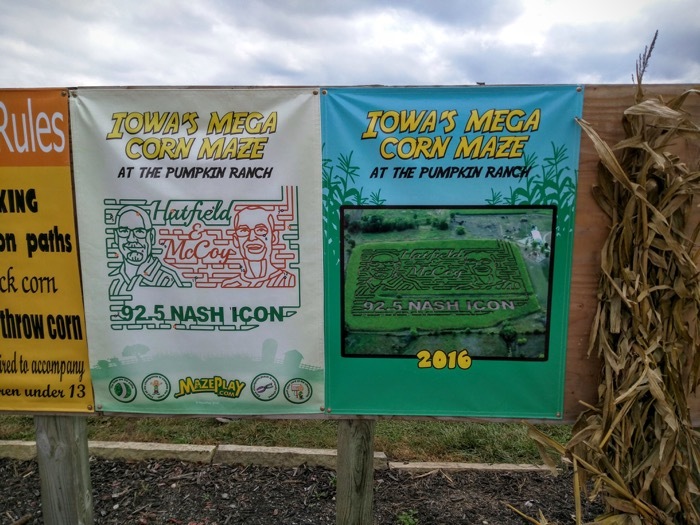 Disclaimer: The radio station I work for is a promotional partner of The Pumpkin Ranch. I was provided admission passes for my family to visit. All opinions are my own. Those that know me know I rarely follow recipes. To me recipes are idea starters. A place to go for inspiration. Sometimes I’ll ditch the recipes altogether and just get creative in the kitchen. It’s fun seeing what I can make with whatever we have on hand. My oldest daughter is starting to take after my adventurous ways in the kitchen and this past weekend we got a chance to collaborate on a dish. We had the perfect opportunity because my wife was working late and my youngest daughter was at a school dance. We started knowing that we wanted to use some of the shrimp that we had in the freezer. From there we could have gone in several directions but went with whole wheat spaghetti noodles. While the spaghetti was cooking we got working on what we’d mix with it. Since we’re garlic fans we sautéed 4 or 5 minced garlic cloves and a bunch of chopped green onions. Next we added a half bag of fresh spinach and cooked it down. After that the shrimp and a can of mushrooms were added to cook. We stirred in a little olive oil and tasted our dish. It needed a little something and my daughter suggested lemon juice. I was skeptical because lemon juice isn’t one of my normal “go-to” additions when cooking… but I agreed. I didn’t want to stifle her creativity. It’s a good thing I didn’t. The fresh squeezed lemon juice was a great addition. She started out using just a little and ended up adding the juice from half a lemon. Another taste called for just a little salt. Then it was time to mix it with the cooked spaghetti. My daughter plated our food and we sat down to a fantastic meal! 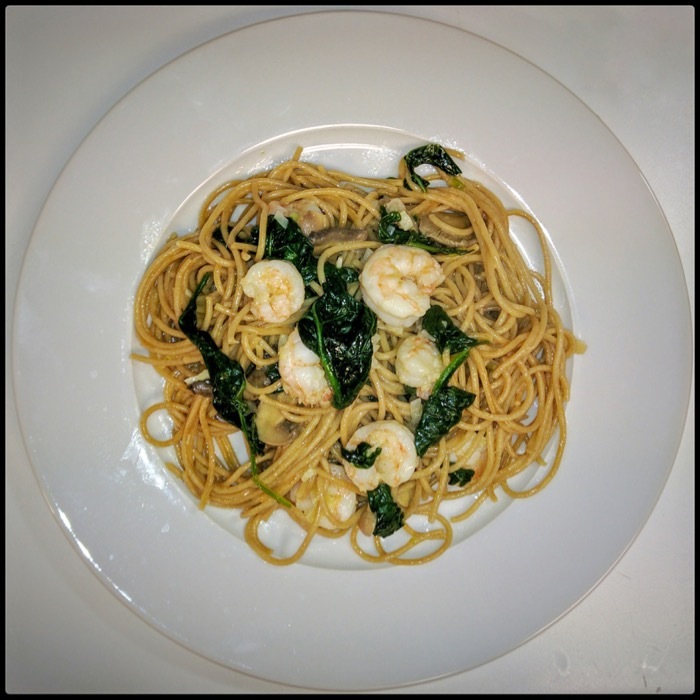 I share our experience to encourage you to get creative in the kitchen. See what you have and then see what you can make. Not every dish you make will be a home run but if you use ingredients you like it’ll more than likely be edible. If you’re lucky, you’ll come across some new ideas… just like I did with the lemon juice. 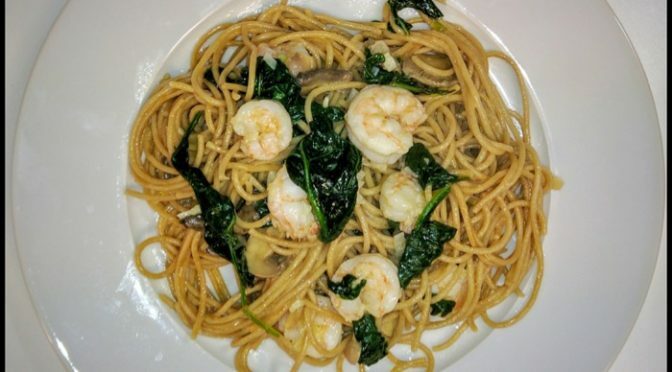 Have you ever made up a dish as you went along? How did it turn out?